It was at Moorend, the woody site by Lane End village in the mud that I mused on sawing. I was undertaking on the boss’s instructions the cutting up of a fallen tree which was partially blocking a part of the greensward where people and dogs might pass by. To reach the tree where branches temptingly- well branched out- eagerly waited my sharpened saw-I had to cut through a mass of brambles. After that decisions, decisions…….and similar to the other Thursday clearing a fallen crab apple tree up in the Nettlebed Common woods at Priest Hill…….you can either lop outer twiglets so you can see more of where you are going without a spike up your left nostril to be followed by going in further and sawing where the branch is thicker (conveniently swapping pruning for bow saw). Sorry, dear Reader, a long sentence there but you follow I’m sure. Or, second option, push your way deep into the mass of twigs, twiglets, thin branches, clambering ivy and whatever else and sawing through a sizeable diameter of tree branch. That way you can pull clear a sizeable chunk to be cut into smaller bits for carrying or dragging away perhaps by other team members. But back to my musings and the saw pits of Queen Ranavanola I (1828-1861). It is alleged that this strong and possibly tyrannical ruler of Madagascar executed her subjects (when required) by a variety of means including sawing the miscreant in two. This topic and its setting is delightfully recounted in George McDonald Fraser’s novel Flashman’s Lady, a right fun read. Whether the sawing was cross wise or sagitally (posh word for straight up and down like an arrow) is not clear. On further investigation it seems this form of punishment has been practised by all sorts of rulers and peoples at various periods of time. I gather Emperor Caligula (not the sweetest sort of bloke) liked watching these executions ordered by him as they acted he reckoned as an aperitif before eating. Talking of saw pits there is a wonderfully reconstructed one at the Weald and Downland Museum, Singleton, West Sussex. The pit has a cover so that the sawyer at top and the sawyer at the bottom in the pit are protected from the weather. The timber is held in position with wedges known as ‘ dogs’ and one theory is that this is the origin of top dog and underdog. 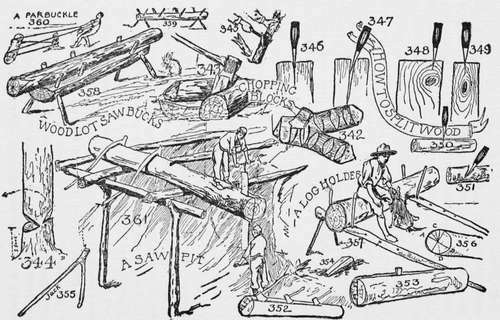 There could be niches in the pit for storing oil for the up and down saw and for ‘kerfs’ , pieces of wood as wedges to keep the saw cut open and aid the motion of the saw. Other examples of saw pits in different states of preservation can be found at Lennox in Ayrshire and at Cotehele in Cornwall. Well, I could write a lot more, but you would only get bored and I haven’t touched on my sawing techniques, things that work for me. I like sawing even as much as or nearly as much as using the slasher, but you know about that. But the lovely feel of the saw blade across and back and forth, the zzuhhhh sound, the cascade of sawdust, the gradual opening of the saw cut, the crash or snap as he comes splintering down…….ah me!